Recent advances in the carbon budget science over the past year have now shrunk this budget to now much less than 1000 Gt, to somewhere closer to 600-800Gt. The Rogelj et el paper is the main paper quantifying this lower carbon budget but the budget is shrinking because the climate science is also getting much more dire. This study shows that, in some cases, we have been overestimating the budget by 50 to more than 200%. At the high end, this is a difference of more than 1,000 billion tons of carbon dioxide. Including all greenhouse gases and using methods based on scenarios that avoid instead of exceed a given temperature limit results in lower carbon budgets. You recently asked a question about our paper. Indeed, if natural release of carbon would increase further than what is currently projected under climate change by models, the remaining budget would be reduced. This is a field of active research. I’m only aware of a study looking at permafrost melting (http://www.biogeosciences.net/9/649/2012/bg-9-649-2012.pdf), which found that in very low scenarios (in line with 1.5 and 2°C) the contribution of melting permafrost would be relatively small. For the other processes I don’t have an estimate of their magnitude at hand. In any case, one finding remains clearly valid: to limit warming to any level, global man-made CO2 emissions need to become zero. If meanwhile some processes have started releasing additional CO2 into the atmosphere, also this additional CO2 will have to be dealt with. Are policy makers waiting for the science or just stalling? What policy makers should want to know now is the best current estimates of this additional CO2 – and of course the non-CO2 forcing agents. Are they waiting for the science to be exact or just stalling? If I had the energy and the talent, I could write a book on personal encounters and correspondence over the past few decades. It’s not just passive stalling, it’s active feet dragging and digging their heels in. Even the better politicians like Lord Deben and Lord Stern can’t beat the business lobby. Deben has said that there is only so much that is politically possible and Lord Stern has said that in a race between growth and the environment, growth will always win. 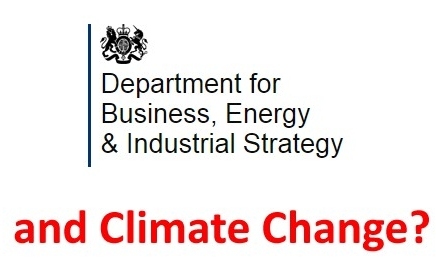 The bad news is that the UK Government’s climate change brief is now owned by the Department for Business, Energy & Industrial Strategy. It is now the sponsoring department of the Hadley Centre, the Met Office research centre. I think of “newBIS” as the old DTI (!!) and we should suspect they will be lobbyists for business against anything too drastic on climate. Too Little, Too Late by Parliament’s leading climate change campaigner is the first account by a political insider to bring home the devastating truth about the blundering and delays that have brought the world to the tipping point of disaster. Colin Challen MP writes a coruscating damnation of the indecision and lack of political courage which has characterised attempts to deal with the issue. Always plain speaking, his book exposes the wholesale inadequacy of current policy and demands an urgent change of course.